Chia seeds are nutritional powerhouses with an abundance of essential fatty acids, protein and fibre. In fact they are the highest source of fibre of all seeds containing 5g per serving! Increasing the amount of fibre in your diet can help to regulate blood sugar, keeps your gut healthy and reduces blood cholesterol levels. This magical seed is also incredibly versatile and can be used in porridge, smoothies or as chia pudding or snack pots that are both satisfying and portable, so you can take them to the office or pack them in a kid’s lunchbox. There is nothing better than vibrant citrus to invigorate the senses and counter the affects of the afternoon slump. I created this superfood snack-pot with maca powder for a nourishing boost. Maca is considered an ‘adaptogen’, as it can help the body to naturally adapt to stressors such as a demanding job, a busy schedule or intense physical exercise. Instead of reaching for the chocolate bar or biscuit tin during a sluggish afternoon, try this ultra-low sugar snack and sail through the rest of your day! Pour the chia seeds into a a container with a lid (I use a glass jam jar) and add the lemon juice and almond milk and stir. Add the vanilla and maca, fasten the lid and shake vigorously and then leave aside for 30 minutes (or overnight) to thicken. After 30 minutes, remove the lid and stir in the yogurt and stevia drops. Divide the mixture into two small glass pots and sprinkle with the lemon zest and some coconut flakes. Sugar – more sour than sweet? How sweet is your tooth? Are you addicted to sugar? A lot of us may be. Too high an intake of sugar is undoubtedly linked to the global increase in diabetes and obesity. One of our pharmacists, Donal Clarke, tells us about his journey towards ‘free-sugar-free’ living and shares some tips on how to reduce your sugar intake. 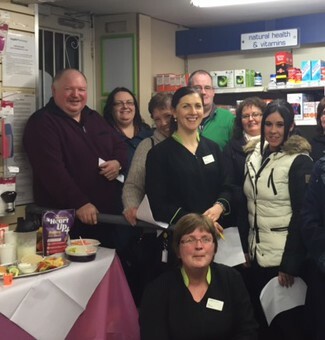 I work as a supervising pharmacist in LloydsPharmacy Greystones. About two years ago I noticed I was getting very dry-mouthed at night over three consecutive days. I regularly help patients in the pharmacy with the use of their blood sugar monitors and I confirmed that my overnight or morning fasting sugar level was above the established range of a healthy person. My slightly elevated sugar levels put me on the road to entering the bracket of people who would be considered prediabetic. Type II Diabetes is a chronic disease affecting ever more of the world’s population and is one which carries a series of painful and life-impeding complications. It is chiefly characterised by the body’s inability to maintain normal sugar levels following the ingestion of food. I was motivated to begin researching how to reverse or halt the progression of elevated blood sugars from turning into prediabetes or eventually Type II Diabetes. There are individual cases and a growing number of actual studies which have shown that losing a significant amount of body weight and maintaining this lower weight can at least temporarily reverse both conditions. I was determined to recover my own normal blood sugar levels and did so over a long month of reduced calorie intake and strict avoidance of sucrose. In four weeks I lost about half a stone in weight and by the end of week two of the “diet” my blood sugar levels returned to a normal range. The problem with any crash diet is that statistically most people return to the same or a higher weight within a year. This is most likely due to the difficulty we encounter in maintaining healthy behaviours. It can be difficult to keep to a regular exercise regime and eating only ‘good food’ unless there is the correct environment to encourage those behaviours. For exercise this might be an obligation or commitment to a club or society to show up to practice. For food it might mean cooking the vegetable-based meal in larger batches for the rest of the working week. How much sugar should we be taking in? The reason they have given a recommended intake for free sugars is that these sugars have been shown to be directly attributable to the growth of obesity and Type II Diabetes. Specifically, soft drinks alone are thought to have contributed to the death of 25,000 people in America in 2010 due to complications of metabolic syndrome related disease like diabetes and heart disease. Eggs, meat, nuts, vegetables, quinoa and many of the other healthy foods we can eat are all low in sugar, often less than 5% of their weight, and more importantly the sugar they contain is wrapped up in fibre that the body must break down before absorbing. The problem with modern packaged food products is that the natural fibre has been removed. The labels on processed food will show them containing anywhere from 15 to 80% sugar content depending on food type and brand. The sugar content can be immediately absorbed, overwhelming the liver which has to process it. The “sugar hit” that modern processed food gives us is the reason you will hear more and more about visceral fat, the fat that builds up between your organs, which is a result of the body’s attempt to store the high peaks of sugar it cannot process quickly enough. The answer is to eat whole and unprocessed food. Most natural foods contain fibre, and any sugar or fat also contained is bound up with that fibre. The traditional Japanese diet was very high in carbohydrates (rice, fish, beans and vegetables). They ate food in its original form. Most packaged food, which has an expiry date of more than a few days from its manufacture, has had its fibre removed and sugar added as a useful preservative and sweetening agent. The traditional Japanese culture had some of the lowest heart disease and cancer rates in the world. Now that they consume the same processed food we eat that is rapidly changing. There were roughly 7.2 million diabetics in Japan last year. Visceral fat is one of the signs of what is being called ‘metabolic syndrome’, which is a grouping of symptoms of high blood pressure, high cholesterol, high blood sugars which lead to diabetes, heart disease and many other diseases. Visceral fat does not show on the outside of your body. It builds up around the liver, heart, kidney and pancreas and stops them from working properly, which can manifest itself in medical issues such as insulin resistance (rising sugar levels), increasing blood pressure and cholesterol. 80% of obese people have unhealthy amounts of visceral fat but what isn’t common knowledge yet is that 20% of normal weight people have unhealthy levels of visceral fat as well. How can you test of visceral fat? Not easily. The Body Mass Index (BMI) which is used worldwide to give people an indication of their overall body to fat content does not distinguish between bad (visceral), not-so-bad (subcutaneous) fat or increased muscle mass. An MRI scan or liver ultrasound can indicate what level of visceral fat you have but neither is cheap by any means. A better and less expensive option is to look at what you are eating and how much physical activity you are getting. For 18 to 64 year olds the WHO recommends a minimum of 30 minutes of moderate exercise (walking, swimming, dancing, cycling) a day, 5 days a week, or 15 minutes of intense exercise a day (running, wall climbing, heavy weight lifting) and to consider doing twice this amount for increased health benefits. You can also have your blood pressure, cholesterol and fasting sugars tested. LloydsPharmacy offers free blood pressure checks and your GP can test for cholesterol and fasting blood sugar levels. If your fasting blood sugar levels are only slightly raised you have some insulin resistance and taking steps to improve your diet, weight and exercise regime can reverse these stats and prevent diabetes developing at a later date. I find it helps to know the ‘how’, the ‘what’ and the ‘why’ of how sugar affects our health but until the government can change the nature of our food industry, each adult needs to try to control their own personal food environment and that of their children. What can you do to improve your diet? If you don’t stock a food at home you can’t eat it so never shop when you are hungry; you’ll have lost the game before the first item gets into your shopping basket. Consider anything in packaging to be processed. It should on your avoid or reduce list. The portion sizes we eat have slowly increased in size over the decades. Studies have shown that most people will eat a large portion of what is on the plate regardless of the actual amount of food presented to them. So simply putting smaller amounts onto your plate can work. “Hara hachi bun me” or “hara hachi bu” is a teaching of the Okinawans in Japan meaning ‘eat until 80% full’. They have the highest number of centenarians (people living to be 100 years) in the world. Keep food intact when you’re cooking or eating it. Boil, grill or steam it. This preserves the fibrous frame of the food and means the sugar, fat and nutrients are slowly released in the gut. For the same reason avoid juicing and smoothies of fruit and vegetables. This destroys the fibrous mesh that enables us to digest slowly and drinks like orange juice can end up having the same effect on our livers as a Coca Cola can due to the free sugar content. Watch out for the obstacles! I still struggle to keep to a good diet and exercise regimen. I do well at keeping chocolate and sweets out of the home which is essential since anything I buy regardless of size would be consumed in a few hours or days. However I find I inevitably allow myself a cookie here or there when I shop (such as from the bakery in Lidl). They rarely make it to the car. If I am going to watch something for 40-60 minutes after work I have to still do something for that period of time. Either I cook or do housekeeping while I watch a program or else I exercise at the same time. An indoor cycling machine is the easiest way I find to keep this promise and means I do between half an hour to two hours cycling a week whether I’m watching a movie or a TV series. Fat Chance: The hidden truth about sugar, obesity and disease. Book by Robert Lustig. This book was one of the first I read about sugar and its health impact and was a huge eye-opener for me. Robert featured heavily as a commentator in the recent Sugar Crash documentary on RTE. http://thatsugarfilm.com/ That Sugar Film was a documentary, briefly mentioned in the Sugar Crash documentary on RTE. A healthy Australian actor ate only foods perceived as being healthy (smoothies, muesli bars, fruit juice, cereal, low fat yogurt and salad dressings) for two months and developed a fatty liver, the first signs of heart disease.. all within 60 days. Visit http://www.who.int/ and you can find the official recommendations for sugar in your diet as well as the exercise recommendations for children and adults for maintaining a minimum level of health.